High Flying Air Cadets from 1557 (Friars School) Squadron had their personal achievements recognised during a special Awards Ceremony attended by the Mayor of Bangor, Cllr Hughie and OC No 2 Welsh Wing, Wing Commander John Goggin RAFVR(T). 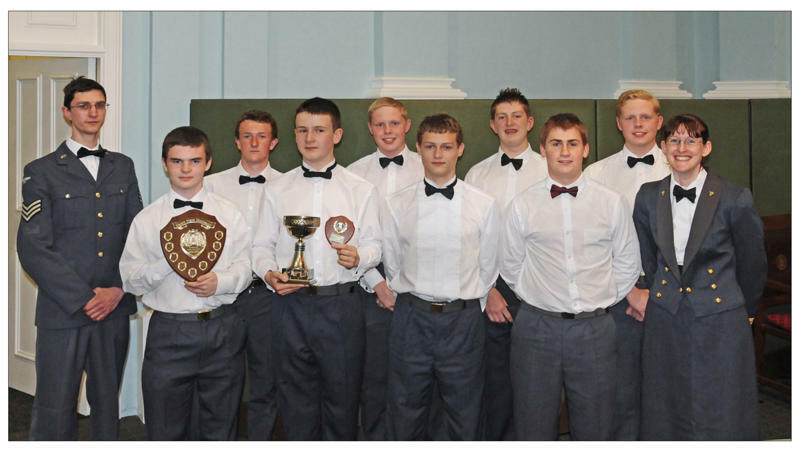 Members of 1557 (Friars School) Squadron Air Training Corps held their annual Cadet Awards Ceremony on Friday, 20th May 2011 at Penrhyn Hall, Bangor. The evening was also a celebration of the squadron�s 70th anniversary on the 12th May 2011 and included a reunion of past staff and cadets of the squadron. Flight Lieutenant Nina Thomas, Officer Commanding 1557 (Friars School) Squadron opened the formal proceedings by welcoming the guests and an audience of cadets, parents and friends of the Squadron and expressed her thanks for the support they had given to the unit over the past year. Rev Vaughan Prytherch delivered the opening prayers for the evening, before Flt Lt Thomas continued with the award ceremony which recognises the work and achievements of cadets both in their personal development and in support of the local community. Each of the dignitaries present was invited to present an award along with representatives of the local groups who have sponsored awards. The Best Recruit - This award goes to the cadet who has shown the most enthusiasm and improvement during their first year as a cadet. The award, donated by The Royal Air Force Association, Anglesey Branch, was presented in absence to Cadet Jordan Davies. The Attendance Award - This award goes to the cadet who has attended the squadron most regularly, it recognises the time and commitment of the cadets to the squadron, and was awarded to Cadet Dean Davies. Sports Cadet - This award, donated by Bach Ventures, goes to the cadet who has demonstrated the most outstanding commitment and sporting achievement at Squadron, Wing and Regional level. The Winner was Cadet Thomas Newman for his achievements in swimming. Lear Trophy for Endeavour - This award is given in memory of Mr H Lear, a past teacher at Ysgol Friars. It recognises commitment, enthusiasm and achievement as an Air Cadet. 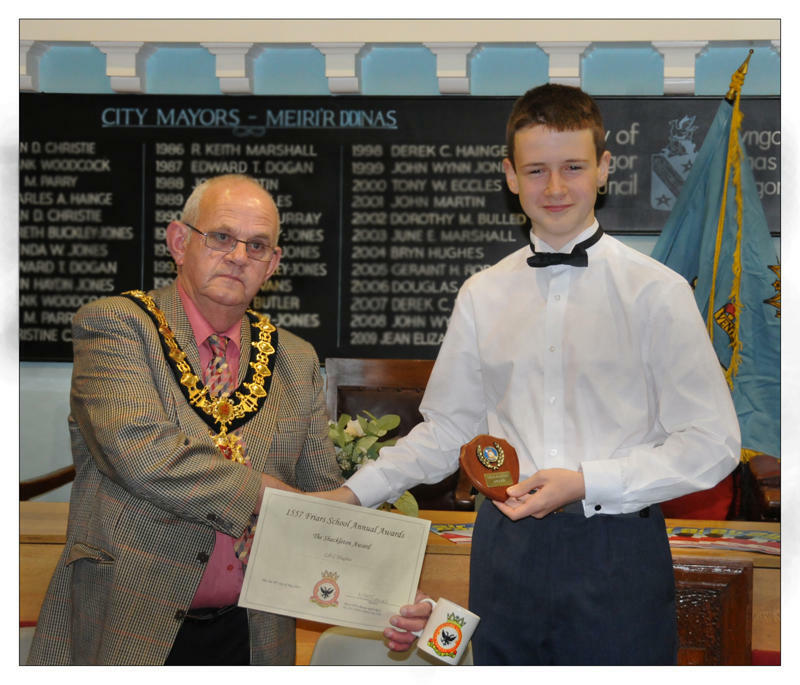 The award was presented to Cadet Callum Hughes. Shackleton Award � This award is awarded to a cadet for �the most memorable or funny moment� of the year. The award was presented to Cdt Callum Hughes for the amusing trait of stating the obvious. Following the award ceremony 3 cadets from the squadron delivered a presentation on the activities which the cadets have been involved in during the past year, including gorge scrambling, parades, flying, camping and much more. Wing Commander John Goggin RAFVR(T) followed with a vote of thanks to the squadron expressing his admiration for the effort and commitment shown by all the cadets and staff of the Squadron, before Rev Prytherch ended the formal part of the evening with closing prayers. The cadets, staff and visitors then enjoyed a good chat over refreshments, organised by the Squadrons Civilian Committee, and many enjoyed the opportunity to catch up with old friends.